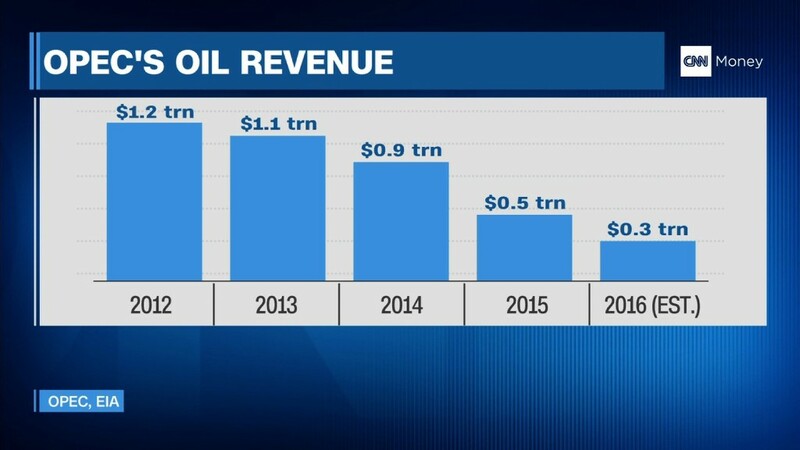 The oil glut isn't going away anytime soon. Supply will continue to outpace demand well into next year, the International Energy Agency said Tuesday, sending oil prices falling by as much as 2%. Demand for oil, particularly in Asia, is growing at a slower pace than it had previously predicted, the agency said. Oil prices collapsed over the last two years because the world has way more oil than it can consume. That surplus will persist at least through the first half of 2017, the IEA said, reversing a forecast it made just a month ago. "With the price of oil at current levels, one would expect supply to contract and demand to grow strongly. However, the opposite now seems to be happening," it said in its latest monthly report. The Paris-based agency said demand is slowing in countries that were previously driving the market, such as India and China. At the same time, big oil producers keep pumping like there is no tomorrow, despite the collapse in prices and investment cuts. Stocks of oil in the world's richest countries are swelling to levels never seen before. OPEC countries pumped out slightly more than 33.2 million barrels of crude oil per day in August, around its highest level ever. The Saudi-led cartel has been trying to squeeze out higher-cost producers and defend its market share. But the price collapse is hurting. OPEC members and Russia have been talking -- on and off -- for months about capping production to support prices but the talks have so far led to little action. The latest figures show Saudi Arabia and Iran actually increased production ahead of a critical OPEC meeting later this month to discuss freezing output.